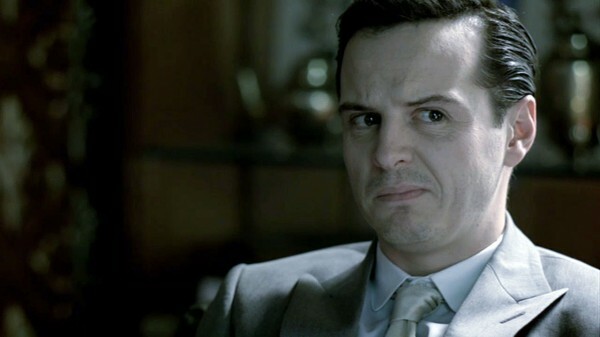 But What Did Sherlock Plan for the Bachelor Party? 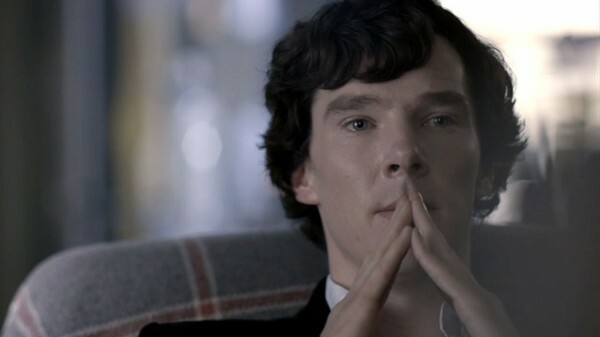 SPOILER ALERT: The following contains information and links that reveal confirmed information about Sherlock Season 3 content. Please Stop Reading Now if you do not wish to know anything in advance of the actual airing of the Sherlock Series 3 in your area. Okay, you can’t say you haven’t been warned. 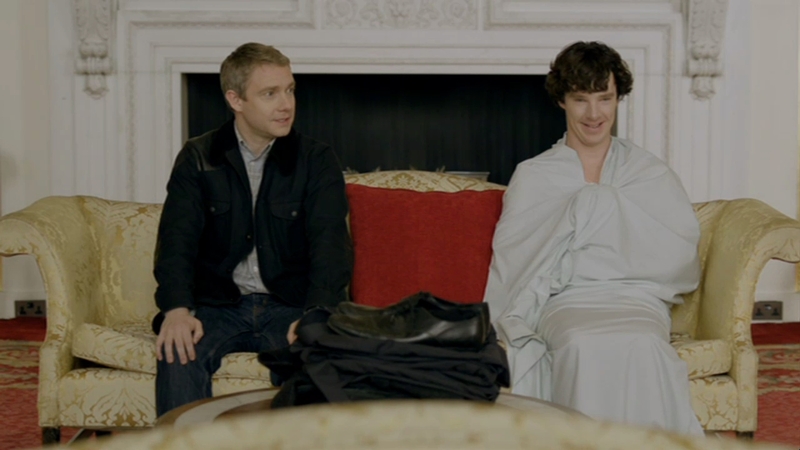 So, Sherlock, that’s what you’re planning to wear to the wedding, is it? This entry was posted in News, Speculations and tagged Andrew Scott, bbc sherlock, benedict cumberbatch, Mark Gatiss, Moriarty, Season 3, Steven Moffat, Sue Vertue on July 20, 2013 by JH Watson. Good Thing You’re Not One of the Criminal Classes, Eh, Sherlock? 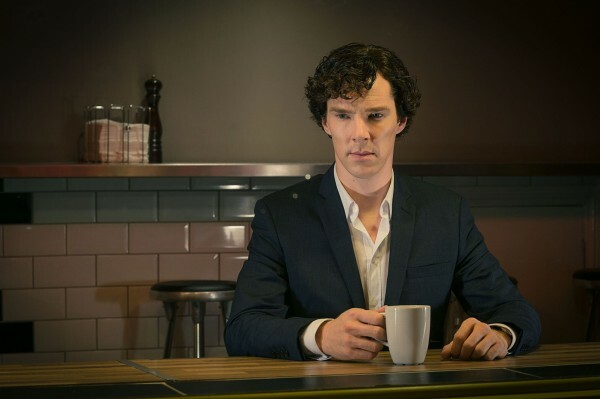 I’m rapidly crating a list of movies I haven’t seen (and had little interest in seeing) that I want to see now that some scathingly brilliant folks have done a mash-up with Sherlock. Enjoy while I work on getting the rest of the post-convention stuff unpacked and online. This entry was posted in Fan Videos and tagged Andrew Scott, bbc sherlock, benedict cumberbatch, fan video, john watson, Mark Gatiss, martin freeman, rupert graves on November 8, 2012 by JH Watson. 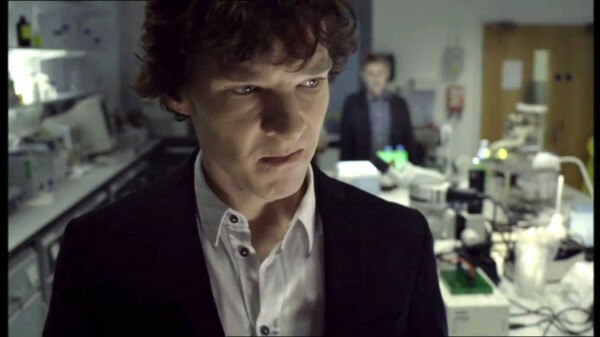 Sherlock Had Binders of Women? Really? I also apologize for not getting a) more posts up this week and b) getting the Mycroft Birthday story posted. In the case of the story, it mushroomed (bloomed?) to over 7K words in length and I’ve just now found an ending I satisfied with. So I’ll be getting it up this week. Honest. I just want to give it one more day to stew and to re-read it so I can get some of typos corrected before posting. In the case of the posts, I’ve been finishing up with the online marketing classes I teach (Master WordPress is always such a monster — and I always forget what a time-sink it inevitably becomes) plus getting as many of the swag bag goodies done for the Seattle Sherlock Convention before this weekends work party. (Hint: There are lots of cool things in the bag, some of which will find their way onto the site *after the convention* and in time for the holidays). 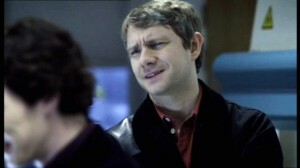 I also discovered I can’t watch Sherlock, Season 1 or 2, while using a paper cutter. I keep wanting to watch Sherlock instead of the paper I’m cutting. I ended up switching to The King’s Speech and then watching Sherlock while I folded clothes (I had to have something to wear to the Sherlock Con work party.) Reminder, registration for the convention ends this week, 25th Oct., 2012. This entry was posted in Captions, Other and tagged Andrew Scott, bbc sherlock, benedict cumberbatch, humour, john watson, Mark Gatiss, martin freeman, Moriarty on October 22, 2012 by JH Watson.